The transition from canter to walk requires smooth application of aids so your horse slows down in a calm, organized manner. There should be a precise downward transition from canter to walk. But horses too often run through the transition, going from a canter to an off-balanced, bouncy trot before finally collapsing into a walk. The key to a smooth canter-to-walk transition starts before you ask your horse to walk. You need to prepare yourself and your horse for the change of pace so that you are in the proper position to ask for the transition and support your horse, and so that your horse is paying attention to you. 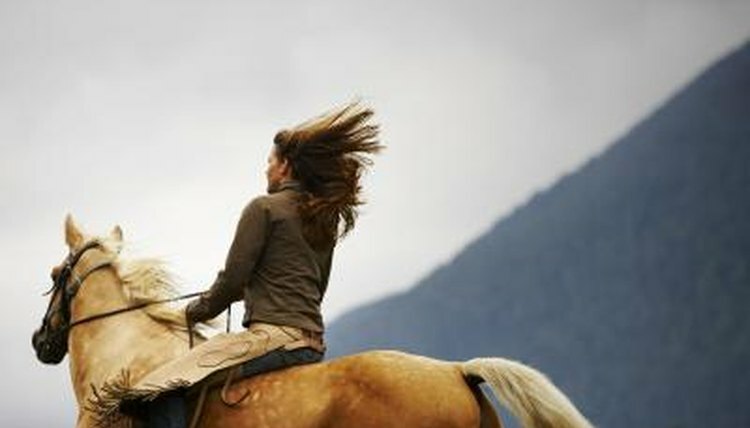 The canter should be relaxed, with you sitting calmly, following your horse's motion gently with your hands. Your eyes should be up, looking between his ears. Gently squeeze the reins, and stop following your horse's mouth with your hands. There is no need to pull back on the reins; simply resisting your horse's forward motion will apply pressure to his mouth. At the same time, sit deep in the saddle. Think of sitting down rather than leaning forward or backward. Finally, keep your legs resting gently against your horse's sides. Your horse should respond by slowing down. It takes a good deal of strength and balance to move directly from the canter to the walk, so you should expect a few trot strides in between until your horse gets stronger. Although it's normal for your horse to sneak in a few trot strides when he is not strong enough to make the transition direct from the canter to the walk, you don't want him to develop the bad habit of always moving through the trot to get to the walk. Frequent repetition from canter to walk, and back up again, will help your horse learn what you want him to do. To help your horse develop the strength and balance to perform crisp canter-to-walk transitions, perform the exercise on a large circle. Develop a relaxed, forward canter, then ask for the walk transition. Walk until you are happy with the quality of the gait, then ask for the canter. Repeat the process, with the goal of shortening the interval between transitions. At first it might take several circles of the canter before you are ready to ask for the walk. But after several weeks of working on this exercise for a few minutes during each ride, you might be able to consistently canter a half circle and walk a half circle.